Sounds wonderful, doesn’t it? And maybe the “teacher-led” kind is possible, because we could structure and guide it, but that doesn’t give students much ownership of their learning. In groups? That might be a bit harder to accomplish. And one-on-one? Well, how do you even manage that? Jeff Frieden, a high school English teacher in southern California, wondered the same thing. Wanting a less teacher-centered class, he was looking for ways to get students talking to each other about the content. He’d tried all kinds of techniques— think-pair-share, appointment clocks, groups of four—but none of them gave him the results he was looking for. When he tried to get the whole class talking in mixer-style activities, they would “poke holes in those systems,” he said. “They just kind of work their way around it to end up talking to their friends, and it becomes more social than content-centered interaction.” Meanwhile, he also discovered that many of his students, who had gone to school together for years, didn’t know each other’s names. Then one morning, just a few minutes before class started, he came up with something new on the fly: A simple system for getting every student in the room to talk with every other student, a way of tracking conversations over time so that students had a reason to reach out to people they never interacted with, and have more meaningful, content-based discussions with each other. Since he started using this method, Jeff says his classroom just feels different. Students are taking more academic risks, diving deeper into the content, and actually getting to know each other. Each student is given a conversation tracker, a chart where they keep track of the conversations they’ve had with other students in the class. Students are to have conversations with a minimum number of other students (set by the teacher—about 75 percent of the class) over a predetermined period of time (say, 2 to 3 weeks). These conversations can be structured, based on topic prompts supplied by the teacher. On their tracker, students record the name of the person they talked to, the date of their conversation, and a one-line summary of what they talked about. Once a pair of students has had a conversation, they may not return to each other until after they have reached the minimum number of unique conversations set by the teacher. 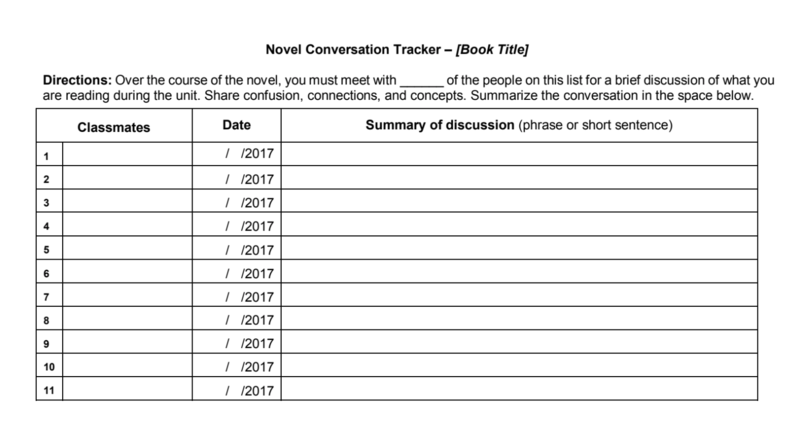 The image below shows one version of a conversation tracker, where Frieden’s students were discussing a novel they’d read. Currently, Frieden scaffolds the conversations by supplying topics for each round of conversation; students are not left to come up with ideas on their own. He projects these topics one at a time on Google Slides: “It might be something as simple as, Explain one thing that really confused you from the chapter to your partner.” Sometimes he’ll recycle a topic by having students switch partners, then summarize the conversation they just had with their last partner. Before switching to this method, Frieden believes far fewer students were actually participating in his class. “For years, I was seeing what I wanted to see with student interactions,” he says. Although his class discussions felt lively, “I might have like a third of my class really interacting.” Moving to Ongoing Conversations gave more students an opportunity to really participate in discussions. This method can be blended with other discussion and instructional strategies. For example, if Frieden is having students do a philosophical chairs discussion, he might have them turn and talk with someone on their side of the room, then record that interaction on their conversation tracker. Ongoing Conversations is a strategy that can be used in any content area. Although Frieden initially structured these conversations around literature, he quickly realized they could be expanded beyond that. When he moved students into an inquiry-based research project, he continued using the conversation tracker, swapping out literature-based questions with prompts that centered on the research students were doing. Do these conversations get a grade? When Frieden first started using this system, he gave students a small amount of points for these conversations, and that would work in a points-based classroom. This year, however, he’s been working toward a modified version of a gradeless classroom, where a student’s course grade is determined by a conference in which the student must justify how well they’ve met the standards. Frieden did not just hand students the charts and tell them to start talking: Even though they are in 12th grade, they needed a bit of structure for the strategy to be successful; younger students would need even more scaffolding. In addition to providing questions for discussion, talk with students ahead of time about behavior expectations, how to initiate conversations, how to ask follow-up questions, and even how to record the content on the tracker. You might even want to model a conversation fishbowl-style, with you as one of the participants, so students can see what a good quality conversation looks like ahead of time. To relieve the anxiety students might feel about these conversations, Frieden launches the conversations by framing them through a lens of mutual support. It was one of those rare moments when you know you’re doing something right. You can learn more from Jeff Frieden by following him on Twitter or visiting his website, Make them Master It, where he shares tons of great ideas and insights about teaching. You can read his original post about Ongoing Conversations here. Brilliant podcast. Thank you both for sharing such a meaningful strategy for supporting student conversations. Can’t wait to give it a go. Thank you! When you do, please let me know how it goes! Glad you enjoyed the post, Tina! Have fun!!! Thank you for this! I love anything which makes the trade of compliance-work for students and for content-learning through life experience. And this is beautifully simple for all grades and subjects! Yes, students need to regularly practice discussions, to know how to get to know another human being, to see all people as people who can help teach us something. This method is a gem! Thank you for sharing! I’ll be using it often! Thanks to you, too, Jennifer, for helping to bring it to so many teachers for so many students! We’re going to have to talk through a mash up of TQE Method and Ongoing Conversations! Either start with Ongoing Conversations to tease out the TQEs before the big class-wide discussion, or the small group > TQE revisions > class-wide discussion is a way for the group to practice before they take the TQE’s to one-on-one discussions. Hi there. Thanks for this. I will definitely use it. I have a clarifying question. What is TQE? Is it similar to DBQ (Data Based Questioning) or QFT (Question Focus Technique)? English teacher, Marisa Thompson, discusses her approach to teaching text in the post Deeper Class Discussions with the TQE Method. TQE (thoughts, questions, epiphanies) is similar to a socratic seminar, but with a few twists — check it out! First of all, I really like how Jeff didn’t adjust his expectations and hopes for genuine content conversation in his room, as many of us may be tempted to do. He kept going until he found something that actually got his students to engage the way he wanted to. The strategy he came up with seems both simple and brilliant. In addition to reaching his goals with this strategy, the concept of summarizing a conversation is a skill needed in the business world. I am currently a student teacher in the midst of a career switch. I was previously at an office job, and I remember finding it surprising and somewhat irritating when my boss told me I needed to draft a recap email following a meeting with a client. Additionally, it was surprisingly challenging: what exactly did we decide upon again? What were the main takeaways? I wish I took better notes! I think summarizing a discussion is more complicated — and perhaps more useful — than summarizing text, which is something we have our students do all the time. I hope I can launch this Ongoing Conversation strategy in my placement or at my first real teaching job. I can see how this would be easily adapted to a social studies classroom, and could even maybe be used as a “warm-up” where students start class discussing current events. Taylor, thank you for the encouraging words! I am delighted to hear that this could be something you use as you enter the classroom. When I first entered the profession, I taught the way I was taught. The way I was taught worked okay for me, but it wasn’t resonating with my students, and it didn’t fit the needs they had. So, good for you to break out of the mold set for you (assuming you didn’t have strategies like this when you were in school). And, yes, it was challenging to keep going with strategies that didn’t quite fit what I was looking for while not giving into defeat (“I guess kids these days, can’t do this kind of thing”). But I have thought my way around a few problems as a teacher. In some cases, it’s just a matter of persistence over time. What you said about the connection with the business world squares up with one listener who is a C-level Executive Assistant for a fairly big firm in the Silicon Valley (apparently the audience of this podcast expands beyond the public education sector). She tells me that this is sorely lacking in the business world. The way she describes it, the work environment sounds like too many classrooms where people sit alongside one another, don’t interact, and quietly work on their tasks. They even put their earbuds in and tap away on their keyboards! I have had enough of that in my classroom (where I have a laptop cart). We use tech, we have times of sitting quietly (during Sacred Silent Reading time), but my students are encouraged to process their uncertainty together, to discuss, to interact around content, and even argue amicably with one another after they have built up some knowledge on a topic. More than learning ELA content, I want my students to be fully functional, fully mature members of our society. That won’t all happen in my classroom, but I can help play my part to its fullest. The way Dave Stuart Jr. puts it resonates with me, “for the long-term flourishing of students.” It’s not enough for me that my students learn the content. I expose them to more in the hopes that they will be well-rounded individuals who make a positive contribution and add value to their communities when they leave my classroom. Thanks for commenting and for the encouraging thoughts! Thank you so much for sharing this awesome strategy! I’m also a high school ELA teacher and this is GOLD! I can’t wait to try it with my classes. So glad you enjoyed the post! If you get a chance, let us know how it goes!!! It has been a game changer, for sure! Please connect with me about how it goes in your classroom. I want to hear all about it! I can’t wait to start this strategy! Thanks for sharing! How long do students stay in their conversations? (I realize it may depend upon the question.) Do students determine when the conversation has ended? Or, do you try to get them to stay in conversation for a certain length of time? It does depend on the complexity of the question. If I’m not sure, I will ask for more time than I think they need, then when they are in a lull, I will move them along. But sometimes I use a good old fashioned worksheet, and have people partner up for one section, set a timer, and then walk around to listen to the conversations. Recently, I have used it for close reading strategies, having the student collaborate on text chunking for a decriptive outline. Really, the applications are endless. Just find a opic or a task you want them to engage with, break it down into it’s parts, and then get them talking. Oh no! It was one of the logistics missing in the interview! Simple. Use Google Slides, click “insert” in the top menu, click “video” > search you tube for the desired timer (I usually search “4 minute timer”) > adjust the size of the video to fit your needs on the slide (I leave enough room for a prompt/question and the video countdown. I like the bomb with the fuse. That’s my favorite). I am in favor of all ideas that address the #1 language art, speaking. Jeff’s commitment to helping students develop as speakers and listeners is a huge gift to those kids. Aww, thanks Erik! My students wouldn’t be where they are without your important work. Thanks for simplifying instruction for the # 1 language art too! Everyone should pick up a copy of Well Spoken at any grade level, teaching any content area. It’s the best! This is a brilliant idea… the missing piece!!!! Students as active participants of their learning rather than passive spectators. Thank you Jennifer and Jeffrey for sharing!! So glad you enjoyed this, Ana! The missing piece, yes! It has helped to improve all the other types of discourse and activities I use in my classroom to get students talking. A big thank you to Jeffrey and Jennifer for introducing this technique with students. I agree with what Eric Palmer mentioned in his feedback. I am also supportive of the accountability factor that Jeffrey has established when the student has to justify the grade or points earned from the activity. Students can be reminded that the teacher is “watching” and following up with a conversation that they will need to be engaged in with the teacher. I loved this podcast. It is something I will put into action to a higher frequency. Thanks again for sharing this discussion-based model and calling it Ongoing Conversations. Thanks, Arjan! The best part about the summary piece is how it helps the students with recall later, which is so much more important than accountability (but it can help with accountability too). When they can retrieve their most surprising insights, or counterclaims to their stance, that’s where the power of the activity really is. To be able to retain and analyze a chain of thought over an extended period of time is one of the best practices I can give to my students. I enjoyed this so very much! I am trying this strategy out in my 7th grade history class starting today. I have modified it to fit my students and teaching style, and cannot wait to see the results! I too have a group of students that don’t know each other’s names, and refuse to step outside of their bubble to talk to people that are not their friends. Our district is focusing on speaking and listening standards this year, so this came at the perfect time. Thank you so much for all of your resources! So glad to hear this, Shania!!! Two thoughts! The great part about this activity is the potential for it to meet many standards all at once. They are speaking and listening, yes. But depending on the topic, they may also be applying several other literacy standards simultaneously, like citing textual evidence. Since I am less familiar with social science, I imagine you may be working with your own set of standards or a framework. That means you could also be asking them to apply standards from that framework as well. There are so many layers! As for your students’ level of comfort in interacting with one another, do what you can to instruct how they initiate and close a conversation. This generation has grown up with screens everywhere, and they are not totally sure how this human interaction thing works. And some times its risky, causing a lot of anxiety. But if we gently coach them, they can rise to the occasion. They really need our help! I just engaged the 9th-grade students in a Novel Chat today. They’re reading Anthem, so we had chats with three different people based on the first half of the novel and a few double-entry journals they’d completed. My students already have a lot of practice with discussions and community norms regarding discussions as we engage in weekly Touchstones Discussions (www.touchstones.org (I’ve mentioned them before)). So happy to have found this method and make your acquaintance. I’ve pushed my classroom towards more voice and choice for the past decade. It’s a slow process, and I still find myself uncomfortable at times, but this method was a no-brainer. The summary box holds them accountable, provides an artifact for the ephemera of the discussion, and allows them to use these discussions for future writing or revision of their own views. Also, as a former speech and debate coach for 25 years, I agree with Erik Palmer that this puts the #1 skill at the fore. And it gives them such great practice with listening as well. Thanks, Garreth! I appreciate the support! Giving feedback can be time consuming, but without worrying about points, I have been energized by the process. When I was using points on assignments, I was trying to justify why students didn’t earn more points, which meant my feedback focused on what students were doing wrong. This was draining psychologically because it made me focus on all the students were getting wrong instead of highlighting what they were doing well and pointing them toward next steps. If you follow my blog (makethemmasterit.com), I plan to post my insights there. But if you’re looking for immediate results into your inquiry about a gradeless classroom, check out teachersgoinggradeless.com/ (also @TG2chat on Twitter and the Teachers Going Gradeless Facebook group). I started using this about a week after listening to the podcast. I use it in my 6th, 7th, and 8th grade Health classes. It really is a game changer. I apply an ongoing conversation to most of the topics I cover and it is generally successful. Question: Do you think it can be over used? I’m starting to notice some students avoiding finding a new partner and some resisting participating. That being said, overall I’m getting a good amount of participation and when I circulate around the class I’m hearing some real conversations. One more question: Do you incorporate a whole class discussion after an ongoing conversation? After they return to their seats I frequently ask for volunteers to share parts of their conversation and wondered if others build this in or not. To both of your questions, YES! Diminishing returns, too much of a good thing, are just part of the way our brains work. Brains also like novelty, so if we keep repeating a task over and over, even one we like, we grow bored. This is normal. For me, I try to go through only 6 rounds of it all year. And to answer your 2nd question, I absolutely would break it up with class discussion. During the episode, I briefly described how I would “interrupt” Ongoing Conversations with a Four Corners discussion, where we would move the discourse from inquiry-based to argumentative. Disrupting the flow of the Ongoing Conversations activity with other types of discussion models is also a great way to bring in that novelty that will freshen up Ongoing Conversations after your students are getting the hang of it. In addition to the list of strategies Jeffrey mentioned, check out Jenn’s post, The Big List of Discussion Strategies, for other discussion models you can mix in with ongoing conversations. I’ve used this method a couple of times in both ELL and English classes for a variety of reasons. I found it was AMAZING in my ELL class where I gave each student a different question about the content and had them write their answer. Then they got to practice asking their question as well as having to answer another persons. Students who had never spoken before were talking! Interestingly, I used it today in my English 9 enriched class and it was a lot less successful. Students did not want to move and I had to facilitate a lot more groups. I am so glad to hear about the success in your ELL class! That’s very encouraging! I am bummed that it’s not met with the same willingness in your 9th grade students (is ‘enriched’ like ‘honors?’). In the podcast episode I discussed that it was a class of 11th graders who were reluctant to talk with one another that led me to create the Ongoing Conversations Tracker, which helped me to get the students moving. My students struggled too. I had to do quite a bit of coaching and cajoling, even getting students to move at random (for instance, they could look at the roster I created for the class, and I could say to the class, “If you’re an even number, then you have to move”). If you are looking to make it a success with your English 9 class, then feel free to reach out to me by email ([email protected]) or you can find me on Twitter @MakeThemMastrIt. I would be happy to help you, or anyone, to think it through.